We’ve tested and reviewed over 20+ reflective running jackets to find the best and brightest jackets available now. Whether you are an early morning runner or run in the evenings, it’s important to be safe and seen in the dark. 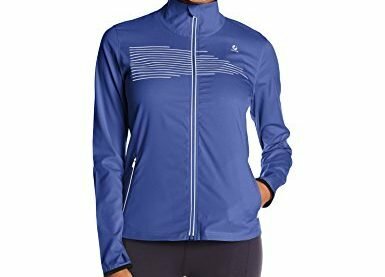 The best reflective running jackets have lots of reflective trim and detailing. Often running jackets have a small reflective logo that companies try to pass off as a reflective jacket. These don’t do much in terms of providing enhanced visibility. 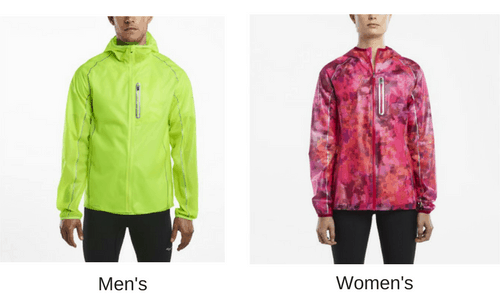 Reflective running jackets should also be reflective against bright headlights – not just a bright, neon color. A black jacket with reflective details that light up when headlights shine on it is a much better alternative to a neon yellow jacket with no reflective elements. Designed for use in low-light and cold weather conditions, the Asics Lite Show running jacket will keep you warm and seen in the darkest conditions. The Lite Show jacket has a reflective print on the front and back. Besides looking good, the print lights up when headlights reflect off it. The lightweight shell helps you keep you comfortable without adding any unnecessary weight. Venting and breathable fabric keeps keeps you dry and prevents overheating. The Asics Lite Show is made with water resistant fabric to keep you dry during rainy runs. The front zipper also includes a zipper overlay which keeps out water and wind. Side zippered pockets provide extra storage. The Storm Shelter is one of the best reflective running jackets on the market. It’s easily the best-priced rain and cold weather jacket available. The lightweight shell is fully wind and water repellent providing terrific all-weather protection. The arms have adjustable cuffs with thumbholes to keep your arms warm and dry even in wet weather. To enhance visibility during night and early morning runs, this jacket has a fully reflective front and back print. A fitted chest pocket has an interior phone pocket to secure and access your phone during runs. The hood snaps on and off depending on weather conditions. The Exo reflective running jacket is built for wet, rainy conditions. 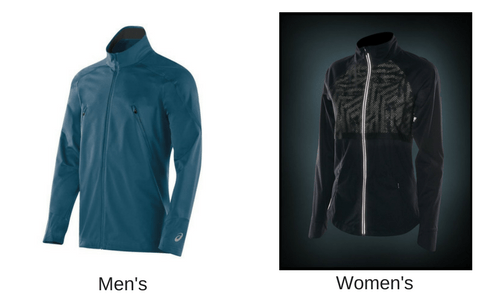 Nylon fabric laminated with TPU film creates a fully waterproof yet lightweight running jacket. Tapered seams further add to the waterproofing in this jacket. Reflective trim on the sleeves and torso enhance visibility in dark conditions. While there isn’t as much reflective design in this jacket as there is in others, it’s strategically placed on the sleeves and torso to highlight moving arms and body to oncoming traffic. The Exo Rain Jacket from Saucony also comes fitted with a hood to keep out rain and wind. And if you need to bring your phone on your runs, you can easily secure it in the fitted chest pocket. The pocket features overlays to keep water out. This reflective running jacket is lightweight and tough. Made with durable, nylon fabric, the jacket is water- and wind-resistant. For visibility, this running jacket features a reflective design across the front, back, and arms of the jacket. Pictured above is the men’s version, but the women’s looks exactly the same. The LSD jacket packs into itself for easy portability. An elastic strap allows you to carry the jacket on your arm when it’s packed up. 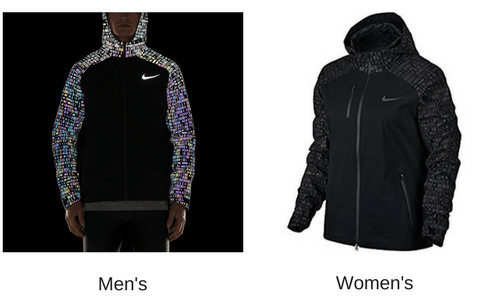 But only the Black/Nebula Reflective color has the reflective elements. The other colors Brooks makes this jacket in don’t feature the high reflective detail. 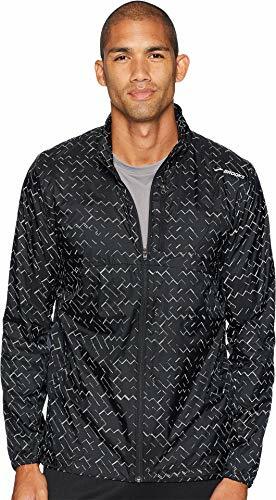 This lightweight men’s running jacket is made from polyester fabric for running in all weather conditions. It features a water and windproof finish that keeps you dry and warm during runs. The jacket has reflective print on the hood and sleeves for visibility in low light conditions. The print is emphasized in the arms for reflective movement to attract driver’s attention. The hood remains securely in place thanks to a stretch cord at the back which can be pulled to for a snug, comfortable fit. Upper back vents built in to the Nike Essentials Flash running jacket helps maximum air circulation. Finally, zippered hand pockets secure small accessories you carry on your runs. The New Balance Reflective Lite jacket is another innovative lightweight men’s running jacket designed for use in all weather conditions. The outer shell is made from lightweight polyester and spandex. It’s fully water and wind resistant. The NB Dry technology helps draw sweat away from your body. 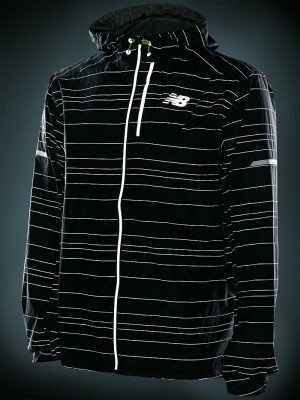 For easy visibility in low light conditions, the New Balance Reflective Lite packable jacket features a 360 degree reflective print. This includes a reflective trim and reflective yarn within the fabric. It comes with an innovative hood design that ties down at the back to keep it from flapping around while you run. When worn, the hood adjusts for a snug fit. When not wearing this jacket, it packs into the front pocket. This packable nature makes the jacket easy to store and carry when not in use. 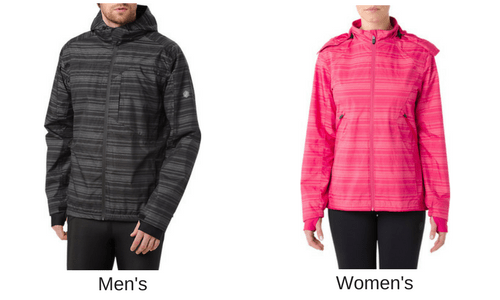 Stylish yet function, the Oiselle New Burke Jacket will keep you dry, warm, and seen. With reflective print on the front, the pattern adds style and highly visible details in low light conditions. The jacket also features two side zippered pockets plus an overlay on the top zipper to help keep out wind and rain. It’s lightweight design dries quickly while keeping you warm on your runs. 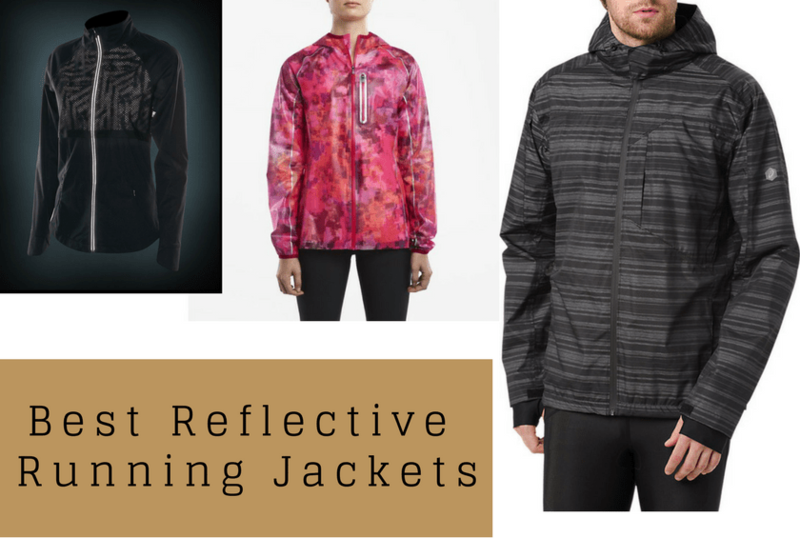 For more versatile and affordable options, check out our reviews for the best reflective gear.